This photograph, posed as an illustration on May 12, 2017, shows the website of the NHS: East and North Hertfordshire notifying users of a problem in its network taken outside the Department of Health in London. 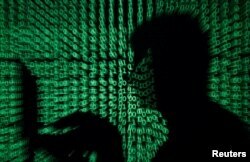 A cyberattack that has already taken over computers in 150 countries could spread further Monday, as people return for the start of a new work week and use computers that may not have been updated with a security patch. Europe's police agency Europol said Sunday the attack had already affected at least 100,000 organizations in 150 countries, with data networks infected by malware that locks computer files unless a ransom is paid. "I'm worried about how the numbers will continue to grow when people go to work and turn on their machines on Monday," Europol director Rob Wainwright told Britain's ITV television. 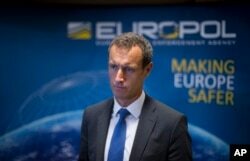 FILE - The head of the European police agency Europol, Rob Wainwright answers questions at The Hague, Netherlands, Jan. 16, 2015. Computer security experts have assured individual computer users who have kept their operating systems updated that they are relatively safe, but urged companies and governments to make sure they apply security patches or upgrade to newer systems. However, the authors of the "WannaCry" ransomware attack told their victims the amount they must pay would double if they did not comply within three days of the original infection — by Monday, in most cases. And the hackers warned that they would delete all files on infected systems if no payment was received within seven days. The researcher, identified only as "MalwareTech," found a "kill switch" within the ransomware as he studied its structure. A man holds a laptop computer as code is projected on him in this illustration made on May 13, 2017. Capitalizing on spying tools believed to have been developed by the U.S. National Security Agency, hackers staged a cyberassault with a self-spreading malware that has infected tens of thousands of computers in dozens of countries. The "kill" function halted WanaCryptor's ability to copy itself rapidly to all terminals in an infected system — hastening its crippling effect on a large network — once it was in contact with a secret internet address, or URL, consisting of a lengthy alphanumeric string. The "kill" function had not been activated by whoever unleashed the ransomware, and the researcher found that the secret URL had not been registered to anyone by international internet administrators. He immediately claimed the URL for himself, spending about $11 to secure his access, and that greatly slowed the pace of infections in Britain. The exploit, known as "EternalBlue" or "MS17-010," took advantage of a vulnerability in the Microsoft software that reportedly had been discovered and developed by the U.S. National Security Agency, which used it for surveillance activities. Microsoft distributed a patch for the software vulnerability two months ago, but not all computer users and networks worldwide had yet made that update, and thus were highly vulnerable. And many computer networks, particularly those in less-developed parts of the world, still use an older version of Microsoft software, Windows XP. The company did issue a patch for Windows XP, but has otherwise largely stopped issuing updates for the software. People are reflected in a glass sign of a Telefonica building in Madrid, Spain, May 13, 2017. 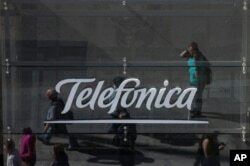 The Spanish government said several companies including Telefonica had been targeted in ransomware cyberattack that affected the Windows operating system of employees' computers. The Finnish computer security firm F-Secure called the problem spreading around the world "the biggest ransomware outbreak in history." The firm said it had warned about the exponential growth of ransomware, or crimeware, as well as the dangers of sophisticated surveillance tools used by governments. With WanaCryptor and MS17-010 both "unleashed into the wild," F-Secure said the current problem seems to have combined and magnified the worst of the dangers those programs represent. The security firm Kaspersky Lab, based in Russia, noted that Microsoft had repaired the software problem that allows backdoor entry into its operating systems weeks before hackers published the exploit linked to the NSA, but also said: "Unfortunately it appears that many users have not yet installed the patch." Britain's National Health Services first sounded the ransomware alarm Friday. The government held an emergency meeting Saturday of its crisis response committee, known as COBRA, to assess the damage. Late in the day, Home Secretary Amber Rudd said the NHS was again "working as normal," with 97 percent of the system's components now fully restored.